This is such a transcendent time isn’t it? 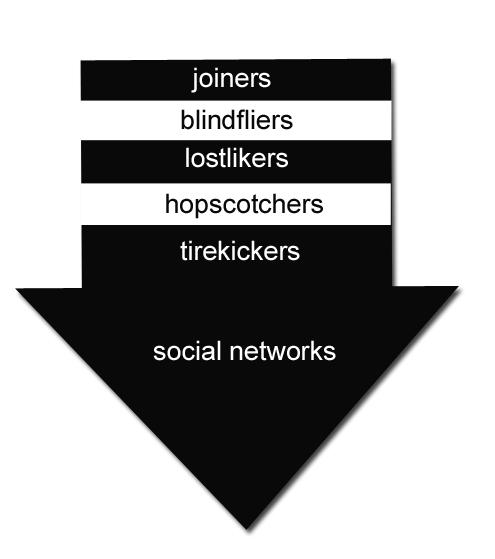 I’ve been thinking a lot about how people use social networks and why. We have talked a lot about digital natives, immigrants, early adopters, lurkers and what not, but there is another group I’ve been tinkering with that I can easily add to the mix. The newbie in social media might think, and somewhat accurately I might add, that it’s easy to just dive right into social and worry about the big stuff later. True, you can, but I like to categorize those people as the one’s who leap before looking. They’ll join any and all social networks that they can. By the time they stop to worry about the little things, there will be bigger stuff on top of the big stuff and they’ll gravitate towards that. Then there are those that might look before leaping but don’t really know where they are landing. They are flying blind into social media. They’re excited. They’re not even taking the time to learn, but that’s not really a concern. They’re just happy to be here. They learned just enough to be dangerous. Like how to upload and share photos. They are a critical component to the success of social media-they will share the coolness of it all with others. Some do manage to land after leaping but then they don’t know where they are. Those are the one’s who join a social network without really vetting the users of that group. It just seemed like a cool network to join; Or a cool tool to use, or a good idea at the time. They created a profile and started to interact before realizing that this group is not really for them. There are a lot of people that fall into this category. The good news? They liked their initial experience. Eventually there will be a tribe for all of them. Still others leap and never land-To me those people are not really into it for the right reasons; they are the marketers, agencies, advertisers and companies that are trying to capitalize on all the buzz that they’re hearing. They will create a profile, add a link, and not much more; they’ll think that’s sufficient to get it done- -they’ll soon move on to the new shiny thing. Those people will shortly be touting how brilliant and cool Augmented Reality is. There is of course those that might land but they don’t really care if they do-they are the ones who will test drive, use the networks a bit and move on, declaring that social networks don’t work. They don’t give it a chance. They are not really engaging-or don’t understand the level of engagement needed to be successful. Those are the Tirekickers. They might be useful as beta testers and not much more. If they decided to stay around longer than a month. What other types of users are there that I could add to this? This entry was posted in Social Networks and tagged marc meyer, social media, Social Networks, social tools by marc meyer. Bookmark the permalink. They talk the talk, and have #’s (fans on facebook, following on Twitter”) that make them look like they are social, but all the communication is one way and there are no conversations going on or being built. Believe it or not, some of the worst offenders are big ad agencies and so-called experts in social marketing.